Across the country, co-ops are doing local better than the big guys and outperforming peers in giving back to their communities. 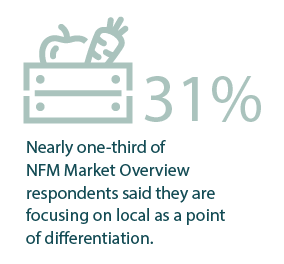 And that insight reveals a key opportunity for co-ops, like their independent natural counterparts, to leverage two areas of their business that have always stood as pillars for success: local and community. Pugh says there are a variety of common denominators among successful co-ops: “First, they continue to reinvest year after year in all aspects of business, from talent to facilities. Second, they focus on both sides of the cooperative: the community side—engaging their member-owners; and the commerce side—managing the business effectively and as efficiently as possible. Here’s how some of these commitments and investments look at co-ops from coast to coast. In operation as a retail store since November 2014, Crane’s co-op, in his own words, is doing very well, and the numbers back that up. Their initial business plan aimed for $2 million to $3 million in annual sales; they finished 2017 at just over $4.2 million, with roughly 4,300 member-owners and a 3,500-square-foot retail footprint. Currently some 37 percent of sales comes from local (state of Maine) products, and it’s truly what sets them apart. “I feel we do local better,” admits Crane. “I’m pretty sure we do it in more quantity than anyone else in our area.” Not surprisingly, produce is the strongest department, but the co-op also stocks an astonishing amount of local dairy, with two full doors devoted solely to local yogurt and kefir. Elkins’ co-op purchases from an impressive 150 to 200 local purveyors in a five-county radius—a roughly 100-mile spread. In 2017, the co-op made close to $3 million in total Washington state purchases, which translated to $4.5 million to $5 million in sales. That’s a lot of money trickling back to a town whose population hovers around 87,500. Perhaps more impressive, the co-op boasts 40,000 member-owners, of which 14,500 are active. In 2017, sales hit $32 million and the co-op made $200,000 in charitable contributions. In the middle of the United States, Louisiana’s urban New Orleans Food Co-op is no stranger to struggle. Nine years in the making in a city, still grappling with redevelopment woes post-Katrina, the co-op currently is spearheaded by volunteer (you read that right—he’s not paid) General Manager John Calhoun, who’s been there since day one. And while Calhoun openly admits he has zero grocery background, his enthusiasm to see a mission-driven market succeed in the city’s diverse Faubourg Marigny neighborhood is infectious. “We’re completely going for it,” Calhoun says. “We’re stepping in as a new local food hub … It’s always been part of our mission, but until recently you may not have been able to see that from looking at our shelves.” Last December’s launch of a new Robért’s Fresh Market three blocks away didn’t do Calhoun any favors, but when this February signaled the closure of Hollygrove Market & Farm, the co-op sprang to life, seizing an opportunity to fill the gap Hollygrove left beyond. “What we’re doing with local allows us to stand apart from every other grocery store in New Orleans,” he says. Despite 4,000-plus member-owners, 6,000 square feet of retail space, and roughly $2.5 million in 2017 sales—their best year ever, according to Calhoun—the co-op has yet to turn an annual profit since opening in 2011, but the altruistic GM remains hopeful. Calhoun says his area lacks an established network of regional food systems, and his co-op doesn’t yet qualify for NCG membership. To compensate, he’s reaching out to farms of all sizes, leveraging his store’s local commitment, particularly with produce, and listening to feedback. “I think it’s actually going to save the co-op, is us reinventing ourselves in this way,” he says. In the northern reaches of the Midwest, Michigan-based Grain Train Natural Foods Market takes a creative approach to local sourcing in light of their four-season climate. “We have a couple of different farmers that we meet with in the wintertime,” says Chelsea Jarvis, retail operations manager and wellness manager, who’s now going on 14 years with the co-op. “We’ll say, ‘We’re going to be interested in purchasing this many pounds of kale or rainbow chard,’ or whatever it is throughout the year, then they’ll work with us, and then they plant that in accordance to sales.” In 2017 Grain Train made roughly $613,000 in local purchases from some 45 different producers within 100 miles. They only expect those local purchases to grow as they continue to build out their deli/fresh operations. Grain Train boasts two Michigan retail locations 15 miles apart: The original Petoskey store opened in 1971 and expanded in 2000 to its current 4,500-square-foot retail footprint downtown; the 1,000- square-foot Boyne City store opened in 2013 and grew out of a local buying club to serve a community with a non-natural retailer as its only grocer. In 2017 Grain Train had roughly $7.4 million in total sales and a member base of 2,000-plus, with community donations/sponsorships totaling $17,000-plus. Early this summer, they’ll usher in a new 2,300-square-foot café just up the street from their flagship Petoskey store. 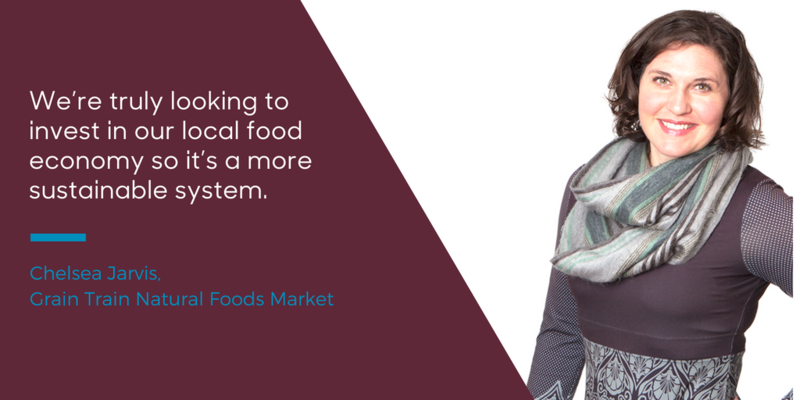 “We’re truly looking to invest in our local food economy so it’s a more sustainable system,” Jarvis says. Going one step further to promote inclusivity, all the co-ops interviewed have initiatives and events to support those in need, including low-income memberships, food-stamp user discounts or rewards programs, payment plans, homeless drives and zero-interest microloans. The Bellingham co-op even waives its membership fee and dues for adults 62-plus. Download the full 2018 Market Overview, complete with charts and methodology, in PDF form below. Natural beauty is booming—but are retailers giving it the attention it deserves?